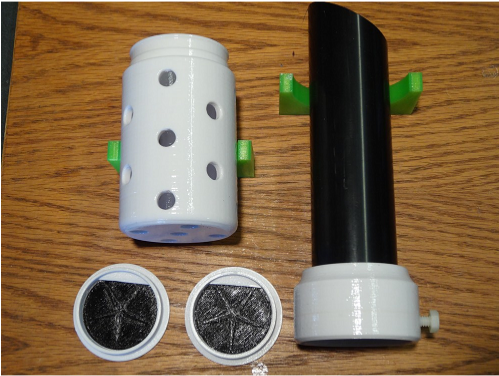 This product kit is being provided for use by individuals who already own or would like to add this attachment to a new purchase of a FissureMan 2" Hand Dredge. This kit is comprised of a FATBoy 1.5" Nozzle, two 1.00" I.D. check valves and the RING KING sift & collect cup, all of which provide for material separation and subsequent collection of various located targets during the search of submerged shoreline environments. The RING KING Kit has been expertly manufactured and designed for use with the bayonet connection points as found on of the FissureMan 2" Hand Dredge. As offered, this kit is supplied with a FATBoy 1.5" nozzle, a RING KING collection cup and two specially designed check valves to provide a collection capability that allows setup at a given location within any shallow submerged shoreline. This capability will provide the metal detectorist an ability to access and easily retrieve gold rings, coins. small fossils and/or other artifacts of various nature using any of the FissureMan 2" Hand Dredge designs available. With its sifting & collection ability, the RING KING Kit collects targets very quickly while sifting and eliminating all undesired material that is smaller than 3/8" in overall size. This is a great addition where a user would need to venture into shallow water to perform collection and sifting normally attempted with conventional dry sand hand scoops. This great tool will separate and move large volumes of sand and unwanted material away from an underwater target site easier than a sand scoop without the operator venturing beneath the surface of the water. No more lost time and/or fatigue from continuous bending over and rising again and again to transfer scooped material to your sifting equipment as performed with conventional sifting, non-sifting scoops and/or shovels. The RING KING Kit will provide volume target site sifting performance that far out paces any simple hand tool commonly used for transferring small, unwanted material from a target site or to a sifting mechanism. Check valves come in an assortment of mechanical designs to be used for various functional requirements. Many check valve designs are made for liquid or gas control. One specific valve design used for slurry control is the Swing Check Valve. The Swing Check Valve has been in use for over 80 years to control the flow of slurries for various material types from abrasives to sludge. This design is used because particulate matter within the flow stream does not adversely affect its operation. It should be noted that FissureMan check valves are not standard off-the-shelf hardware store check valves that are normally used to transfer clear or semi-clear fluids. The check valves used within the RING KING are a simplified version of the time-tested and reliable Swing Check Valve. They have been referred to loosely as flap valves. All FissureMan check valves are designed and constructed in-house to provide a valve system that works as required and by design, vastly reduces the typical malfunction that might be experienced with store bought check valves. - Attaches directly to the latest 2" Hand Dredge without additional modification. - Incorporates the popular FATBoy 1.5" large bore nozzle. - Able to sift and then reject material that is less than 3/8" overall size and smaller - not just the sand. - Uses check valves that are inexpensive and that have the largest material flow through ID available. - Fast shipment combined with both pre and post sale customer assistance. Attach the RING KING components to your FissureMan Hand Dredge body per the included, easy to follow instructions. Find a suitable location and search the site to identify and pinpoint your target. Remove or move the larger debris and/or rocks from the suction point. Set the nozzle on/at your target location and then pump the hand dredge to pick up the material and sift through it. Suction and sift through as much material as needed to collect the target. If the target is deeper than a couple of inches then suction and sift as much material as necessary to finally expose the target. To empty the collection cup it takes a quick bolt loosening and then you are ready to transfer the collected materials and hopefully your target to your pan, bucket, float or whatever material containment apparatus you prefer to use. Replace the collection cup and begin again. It's as simple as that! Operational tip: To help the hand dredge sift material more efficiently, it is suggested that pumping the handle a few of times during the sifting/collection process with just water to help eliminate the buildup of small material during the collection process. This action can be noted during the provided operational video demonstration. Purchased with the Fissureman 2" Hand Dredge design, the RING KING Kit provides target collection capability of the most advanced and versatile sifting & collection system ever offered for use by the Metal Detectorist. Your half way there if you already own the new FissureMan 2" Hand Dredge. All you need to do is obtain the RING KING Attachment Kit and get started! This is the redesigned RING KING Kit. All hand dredges shipped after 4/16/2018 match with this redesign. All previous hand dredge versions will not be backward compatable with this kit design. If you have a hand dredge version older than the above mentioned ship date please request the old version for purchase.